Transparent resin blocks peppered with flowers form the seat and arms of the Miss Blanche Chair by Shiro Kuramata – letter M in our alphabetical Christmas countdown. Japanese designer Shiro Kuramata created the Miss Blanche Chair in 1988, three years before his death. The armchair is named Miss Blanche after the character Blanche DuBois in the 1947 play A Streetcar Named Desire, written by American playwright Tennessee Williams. 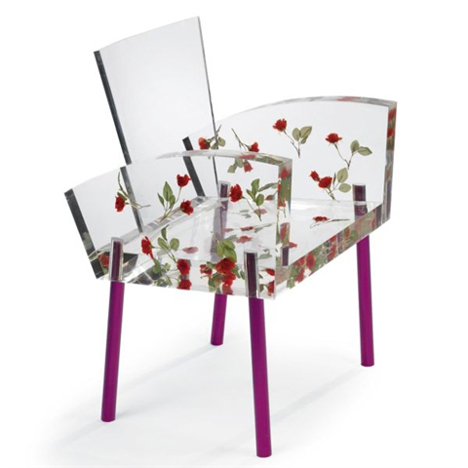 Plexiglass roses are suspended in the transparent resin blocks used to create the seat and arms of the chair. The flowers are allegedly a homage to a corsage worn by actress Vivian Leigh while portraying DuBois in a 1951 film adaption of the play. The roses are poured into the liquid acrylic mixture by hand, before the material slowly dries and hardens. A curved sheet of glass-like acrylic stuck vertically into the seat forms the back, causing the chair to weigh around 70 kilograms. Produced by the designer's studio Kuramata Design Office, the Miss Blanche Chair balances on four pink aluminium tubes. MoMA San Francisco is among the museums that have the chair in their permanent collections, and an edition of the design was auctioned at Christie's in London for £46,000 in October 1997. Kuramata was a member of the Memphis group in the early 1980s and was responsible for furnishing boutiques for Japanese fashion designer Issey Miyake in New York, Paris and Tokyo later in the decade.